PETERBOROUGH have kicked off their Premiership team-building – with the marquee signing of four-time title winner Chris Harris. The 36-year-old former Grand Prix star has had two previous spells with the Panthers, starting his career in the old Elite League as a doubling-up rider in 2002-03. And when Harris became eligible again for second-tier racing in 2017, it was with Peterborough as he produced a sensational display to help the club take the Fours title on a dramatic afternoon at the East of England Arena. Having won the Elite League three times with Coventry, Harris lined up for Poole in the second half of last season and scooped another Grand Final victory – although it was his performance in the semi-final which made the headlines, as he took the Pirates through with a last-race, last-gasp pass on former World Champion Jason Doyle. 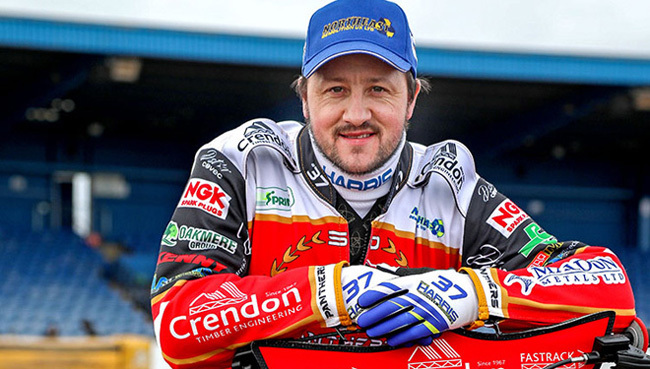 With Panthers keen to build a team which supporters can relate to, as well as one which will perform strongly on-track, promoter Ged Rathbone is delighted to bring Harris back to Alwalton. Rathbone said: “Bomber loved his time at Peterborough when he was here previously, and there were probably only two teams he would have gone to in the Premiership. “From Chris’s point of view it’s a really good move, and it means his family can come and watch him as there’s not too much travelling. Panthers can confirm further announcements are expected over the coming days as plans come together for their return to top-flight racing in 2019.